When you hear "Italian movies," you probably think of Federico Fellini, Sergio Leone, maybe Roberto Benigni, maybe Cinema Paradiso ... and Bicycle Thieves (a.k.a. The Bicycle Thief; see below). Directed by Vittorio De Sica and shot mostly on the rubble-strewn streets of postwar Rome, Ladri di biciclette has been a revered classic of world cinema for more than 65 years, far eclipsing the fame of its own director. Get your bike out of hock and join us as we discuss some behind-the-scenes details about this poignant Italian drama. 1. IT WENT BY THE WRONG TITLE FOR 60 YEARS. 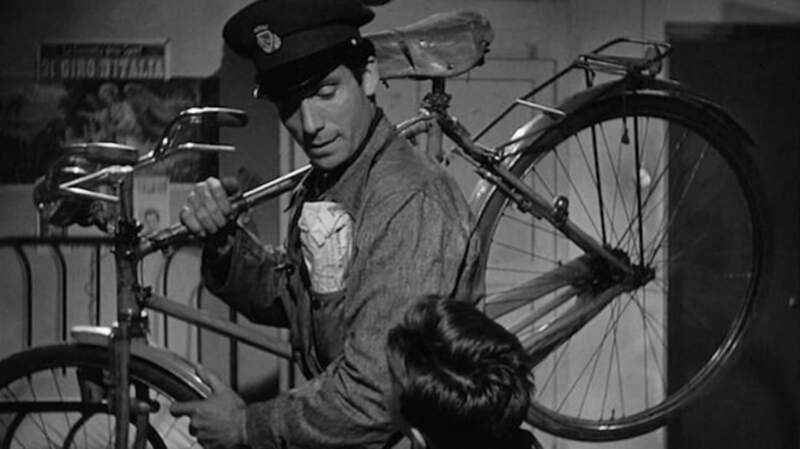 In Italian, it's Ladri di biciclette—Bicycle Thieves. (The nouns are plural. Singular would be “Ladro di bicicletta.”) But for some reason, when it was first exported to America, it was translated as The Bicycle Thief—singular, and with "the" added. Nobody knows why, either, but that's what it was called in the subtitled prints, in advertisements, and in virtually every review and news article about it in this country. (It was correctly titled Bicycle Thieves in the U.K.) It wasn't until Criterion released its definitive edition in 2007 that the American title was corrected. Since then, it has gradually come to be better known as Bicycle Thieves, and The Bicycle Thief is fading away. If you've seen the film, you understand how important the seemingly minor alteration is. 2. MOST OF THE CAST WERE NON-PROFESSIONAL ACTORS. Bicycle Thieves was part of what came to be called Italian Neorealism, a post-war movement where the glossy, polished studio productions of the past were replaced by gritty, authentic depictions of Italian life. Part of the aesthetic was to use non-actors, or at least actors who were very good at being natural. Director Vittorio De Sica wrote, "The man in the street, particularly if he is directed by someone who is himself an actor, is raw material that can be molded at will ... It is difficult—perhaps impossible—for a fully trained actor to forget his profession. It is far easier to teach it, to hand on just the little that is needed, just what will suffice for the purpose at hand." 3. THE LEADING MAN WAS A FACTORY WORKER WHO DIDN'T WANT TO BE AN ACTOR. In April 1948, when De Sica was casting about for non-professionals to be in his film, a woman from Rome named Giuseppina Maggiorani heard a radio announcement calling for a nine-year-old boy. She took a photograph of her son, Enrico, to De Sica's office. The director didn't want the boy, but he was struck by the face of someone else in the photo: Enrico's father, Lamberto, a 38-year-old machinist. Giuseppina persuaded her husband to meet with De Sica, and he was hired for a salary of $1000 (the equivalent of about $10,000 today). Lamberto Maggiorani got great reviews for his naturalistic performance in the film, but things went downhill for him afterward. He returned to his factory job but was soon let go. Business had slowed down, and though Maggiorani had been there for 16 years (minus three months off to make the movie), his co-workers and boss jealously assumed he was a millionaire now and could afford to be fired. At his wife's urging, he returned to the movie business and acted in about a dozen more films, but he never found either the fame or the fortune that the star of one of Italy's greatest movies deserved. 4. THE KID WHO PLAYS YOUNG BRUNO GOT THE PART BY JUST HANGING AROUND. De Sica had to start shooting before he'd found someone to play Bruno, the main character's son. As fate would have it, the right person showed up randomly. While filming the scene where Antonio looks for a friend to help him search for his bike, De Sica saw "an odd-looking child with a round face, a big funny nose, and wonderful lively eyes" in the crowd of spectators. His name was Enzo Staiola, he was eight years old, and he was hired on the spot. He acted in a few more films later before becoming a math teacher as an adult. 5. IT WAS BASED ON A BOOK, BUT WAS DRASTICALLY DIFFERENT FROM IT. Luigi Bartolini's 1946 novel was about a man searching for his stolen bicycle. That's just about where the similarities end. Bartolini's guy wasn't a poor working-class man but an artist who hates the poor. What's more, he has another bike to ride around on while looking for the stolen one! 6. DESPITE THE DO-IT-YOURSELF FEEL, THE FILM WAS NOT IMPROVISED OR UNPLANNED (OR CHEAP). The Neorealist movies often looked spontaneous, almost documentary-like, and some were indeed very loose productions where the directors came up with their stories as they went along. But Bicycle Thieves was actually methodically scripted and had to be carefully planned, especially when it came to the crowd scenes. (There's fake rain in one scene, too—not the sort of thing you can add on a whim.) The total production cost was about $133,000, similar to what films in the U.S. and U.K. typically cost at that time. The fact that it feels like it was made on the fly for no money is a testament to De Sica's skill as a director, and to his non-actors' ability to be natural in front of the cameras. 7. FOR A WHILE, IT WAS CONSIDERED THE GREATEST FILM OF ALL TIME. 8. HOLLYWOOD'S CENSORSHIP BOARD WOULDN'T APPROVE IT. Before the MPAA rating system, there was the Production Code, a set of rules that Hollywood studios semi-voluntarily (but grudgingly) followed. The Code seems silly now—it mandated that even married couples could not be shown sharing a bed, for example—and seemed only slightly less ridiculous at the time. Bicycle Thieves couldn't get approved without making two cuts: a shot of a little boy peeing in the street, and a (sexless) scene set in a brothel. None of the major studios would distribute a movie without the Code's Seal of Approval, so three independent theater chains released it instead. The result? People saw the movie, and almost nobody was offended. The power of the Production Code was weakened. 9. IT COULD HAVE BEEN A HOLLYWOOD PRODUCTION STARRING CARY GRANT. When De Sica (who was already an established filmmaker) was looking for financial backing for Bicycle Thieves, he got an unusual offer. David O. Selznick, producer of Gone with the Wind, Rebecca, and Spellbound, offered to finance Bicycle Thieves ... if De Sica would cast Cary Grant in the lead. De Sica later recalled his reaction: "Grant is pleasant, cordial, but he is too worldly, bourgeois; his hands have no blisters on them. He carries himself like a gentleman. I needed a man who eats like a worker, is moved like a worker, who can bring himself to cry, who bats his wife around and expresses his love for her by slamming her on the shoulders, the buttocks, the head. Cary Grant isn’t used to doing such things and he can’t do them." 10. IT WAS POPULAR PRETTY MUCH EVERYWHERE EXCEPT ITALY. Italian audiences weren't too keen on these drab Neorealist films that depicted post-war Italy as a shattered country with high unemployment and rampant poverty. (Not that the depiction was inaccurate, they just didn't like to see it.) De Sica's previous film, Shoeshine, had been shunned at home while being lauded abroad, and that was to be Bicycle Thieves' fate as well. 11. IT HAD A PROFOUND IMPACT ON THE CINEMA OF ... INDIA. In 1950, a young Indian man named Satyajit Ray spent three months in London at the headquarters of the ad agency he worked for. While he was there, he saw almost 100 movies, one of which was Bicycle Thieves. He said later (and he repeated it many times) that he came out of Bicycle Thieves determined to become a filmmaker. Which he did: his widely acclaimed Apu Trilogy—Pather Panchali (1955), Aparajito (1956), and Apur Sansar (1959)—is a milestone in Indian cinema, and was hugely influential internationally. Directors as diverse as Martin Scorsese, Danny Boyle, Akira Kurosawa, and Elia Kazan have cited The Apu Trilogy as an influence on their own work, which means some of the credit ultimately goes to Bicycle Thieves.